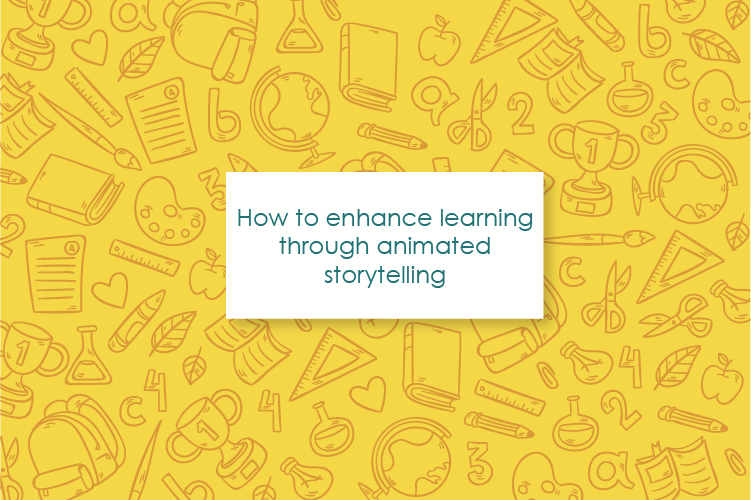 How to enhance learning through animated storytelling? Animated storytelling is getting a lot of attention these days due to its various abilities. It can be used in education, business, and entertainment. 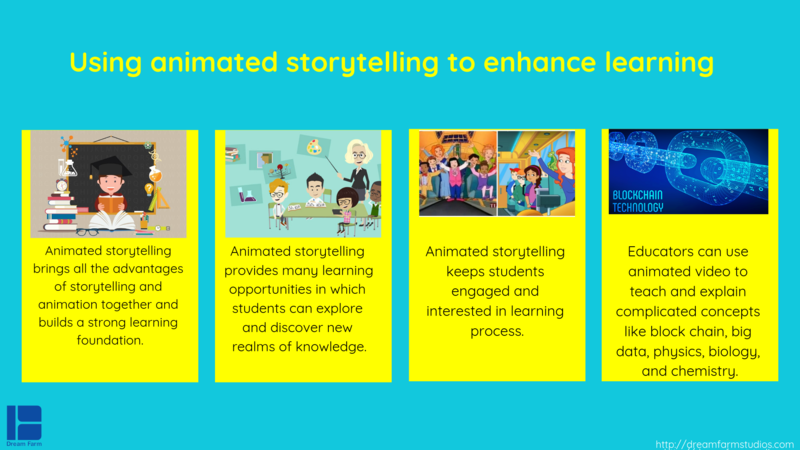 Educators can take advantage of animated storytelling to improve learning. As mentioned before storytelling has the strong power to impress, engage, teach and influence people. That is the reason why the importance of storytelling has been emphasized since the past few years. Also, teachers and educators try exerting storytelling to enhance learning and organizations and businesses, develop their message through storytelling. 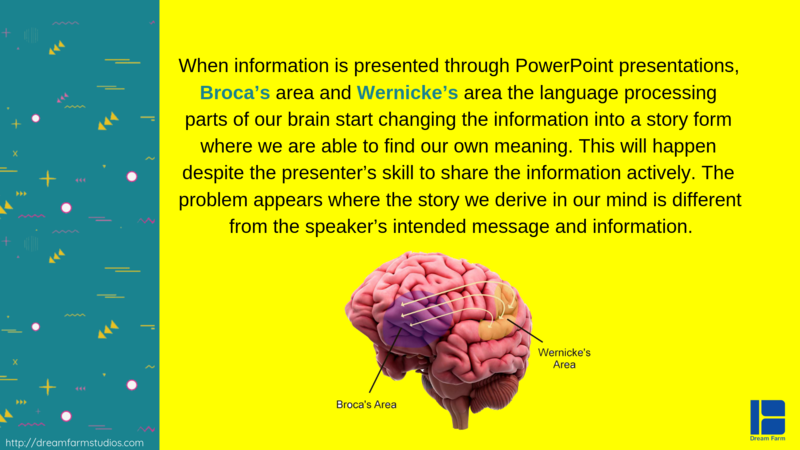 When information is presented through PowerPoint presentations, Broca’s area and Wernicke’s area the language processing parts of our brain start changing the information into a story form, where we are able to find our own meaning. This will happen despite the presenter’s skill to share the information actively. The problem appears where the story we derive in our mind is different from the speaker’s intended message and information. On the other hand, when we receive information and data within a story, not only are our language processing parts of the brain activated, but also other areas in our brain that are used when we are experiencing the events of the story are, too. The more a speaker conveys data and information in the story form, the closer the listener’s experience and understanding will be to what actually the speaker intended. There is another side to learn and receive information through storytelling; the scientific part! When we hear story cortisol, dopamine, and oxytocin are released in our brain. Cortisol has a lot of functions in our body but the one that is related to our story is the memory formulation! It formulates memory and assists us in remembering information. Dopamine plays an important role in storytelling. It regulates our emotional responses which l keeps us engaged in the topic. Learning is a pretty complicated process. In the process of learning, for better learning, concentration is the core criteria which is followed by understanding and remembering. The most common way of teaching from the past to now is lecturing and presenting lessons through explanations. These ways are not efficient in conveying information and also they tend to increase boredom in students or the audience. Consequently, they let the audience loses the core criteria “concentrations”. Losing concentration results in the lack of understanding and clearly, we won’t be able to remember the mentioned topics. Now, what would happen if we choose animation as an educational tool? Animation today has different functions; from commercial and business to learning and education and entertainment. Have you ever wondered why we forget all the lessons we have learned in school but we do not forget scenes from Toy Story? That is, because of the way information found its way to our brain. Educational animation has enriched both educators and students. It is not limited. Animation is a dynamic representation that can be used to make a change and complex processes explicit to the learner[i]. Studies have shown that learning in computer-based animations environments enhanced the understanding of complex concepts and systems compared with traditional learning environments that concentrate on verbal explanations[ii] . If we use animation to enhance learning, the audience won’t lose their concentration. Because they can be informative and fun at the same time. Animation breaks down the barriers of learning through simplifying complex concepts and ideas. Thus learning is enhanced. The process of teaching and learning gets a whole new experience when animations are used during the process. Educators can use animated video to teach and explain complicated concepts like blockchain, big data, physics, biology, and chemistry. Since we, as humans, have a good visual memory. The more this skill is being used, the better the information is remembered. Animated storytelling brings all the advantages of storytelling and animation together and builds a strong learning foundation. Now, students are no longer interested in old fashioned blackboards and teaching methods. They like what entertains them; something like animation. Animated storytelling provides many learning opportunities in which students can explore and discover new realms of knowledge. Animated storytelling keeps students engaged and interested in learning. They can easily find something with so much fun and interact with it. Moreover, educators can break down complicated concepts using animated storytelling. Also, it can facilitate learning. From the moment the educator starts presenting the topic using animated storytelling, he sets a hook. Audiences’ attention is at his mercy, so he can easily transfer knowledge. Furthermore, it offers two main advantages for students. If educators use and assign animated storytelling, students’ creativity will be cherished. It helps students to build their own understanding of life. Moreover, they explore their own personality and characteristics. Animated storytelling is creative by nature. Thus, it empowers imagination. Children are full of authentic ideas. All they need is a bit of confidence and ability to work with a computer. They can narrate their story and bring animated features to their presentation. Students gain self-confidence and self-esteem through creating their own idea with their own material and presenting it in front of others. Animated storytelling has this power to engage and inspire people because of its attractive nature. It is important to use animated storytelling in the right place and the right time to gain effective learning result.